Fantastic personal service comes courtesy of your unfailingly friendly private butler - apart from being on hand for drinks and bringing you meals etc, they'll happily arrange any excursions and will no doubt spring a few delightful surprises on you too! Many luxury hotels are so bland and generic in their styling that you could literally be anywhere in the world - the Matemwe Retreats on the other hand simply ooze authentic Zanzibari architectural style and ambience! The Retreats aren't right on the beach (and the cove is too shallow to provide really good swimming too) - but having your own rooftop plunge pool more than makes up for that in our view! Rather than the bland, generic styling of typical luxury beach resorts, the villas of the Matemwe Retreats simply ooze authentic Swahili island luxury and style - from the coloured screeded floors to exquisite hand-crafted furniture and stunning styling details. 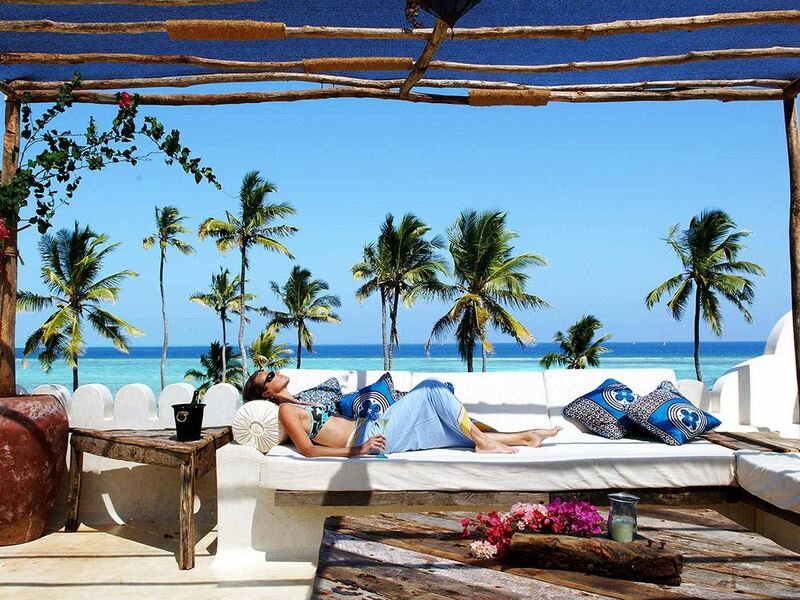 The gorgeous Matemwe Lodge is already one of our favourite lodges on Zanzibar - but if you’re looking for an even more exclusive and personal place to experience the Spice Island, then look no further than their fabulous sister lodge known as the Matemwe Retreats. These are 4 wonderfully atmospheric double storied villas located just to the north of the main lodge – lying on a palm strewn hillside, they overlook a small sandy cove below. The reference to “retreats” is instructive here, as you could literally check into your villa and happily remain there for the duration of your stay! If you fancy acting out your very own fantasy of being a Sultan or princess ensconced in an Arabian Nights style palace, then you’ve definitely come to the right place! Rather than the bland, generic styling of typical luxury beach resorts, the villas of the Matemwe Retreats simply ooze authentic Swahili island luxury and style - from the coloured screeded floors to exquisite hand-crafted furniture and stunning styling details. Then there’s the superb personal service that comes from each villa being assigned their own private butler who will make sure your every need is catered for and that your stay is a memorable one (when we say “butler” just don’t imagine the stiff and formal black suited type; rather you’ll enjoy that wonderfully warm and friendly Swahili welcome that makes a holiday in Zanzibar so special!) 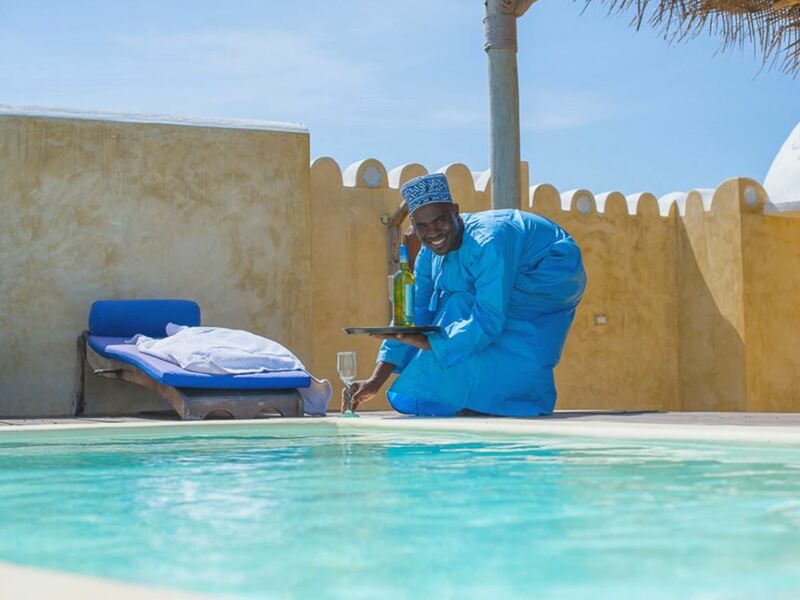 From effortlessly anticipating your need for another delicious cocktail, to arranging a candlelit dinner on your private deck; perhaps organising a snorkelling excursion to the reefs of Mnemba island, or even teaching you how to play the ancient board game bao, guests inevitably rave about the service they receive from the butlers at the Retreats! 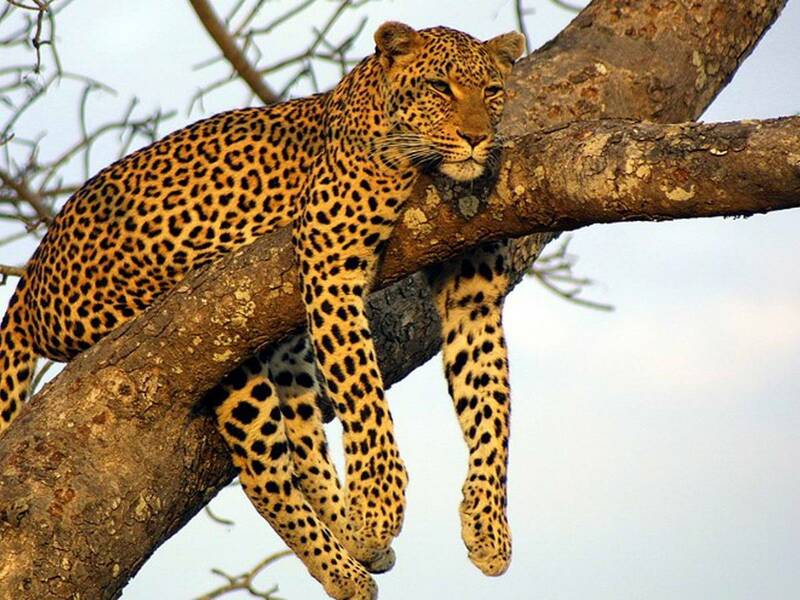 Of course, whilst it’s understandably extremely tempting to spend your days in the warm embrace of your private Retreat, the good news is that if you do fancy being a bit more social then you’re welcome to take a stroll to enjoy the stylish bars and restaurant at the main Matemwe Lodge too. There’s also loads of activities to do in the area which your butler will be only too happy to arrange for you: from picnics on some nearby sandbanks that emerge at certain times of the month at low tide, guided visits to the local village and out to the reef where you’ll no doubt encounter local ladies seaweed farming in the lagoon or hunting for octopus in the shallows, scuba diving or snorkelling on the renowned reefs of the Mnemba atoll, or perhaps a romantic sunset cruise in a traditional dhow. Or if that all strikes you as a bit too much like hard work, you can always enjoy a pampering massage at the Spa!